Home » Russian literature » Al-Barrak. Poem. All-Barrack Poemen. KUSIKOV, Aleksandr pseud. 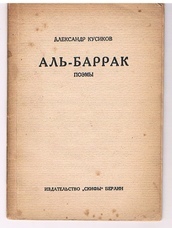 of Boris KUSIKIAN Alexander Kussikoff. Original textured paper wrappers, in very good condition. Mild damp spotting to covers, paper a little browned. 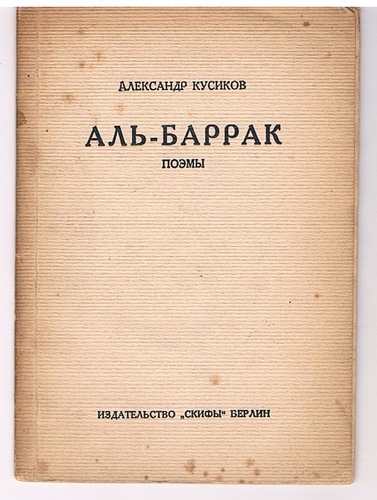 ; Armenian poet born Boris Kusikian but wrote undr the name of Aleksandr Kusikov. With Esenin, a founder member of the Imaginist group of poets. Although an active and charismatic poet as a young man he did not continue with his writings.